Renovate, replace, recoup? Renovate, replace, recoup? David Jones Jones, D.
Unusually low home inventories and the high cost of new housing have put move-up homeowners in a bind. Many are turning to remodeling as a way of adding amenities and value to their current housing. However, the recently released Cost vs. Value Report for 2018 from Remodeling magazine notes many of the 20 most popular remodeling projects aren't generating the resale value they once did. Craig Webb, editor-in-chief of Remodeling magazine, says the report tells what consumers can expect to pay to have a pro do one of the common remodeling projects and how much money real estate experts say you can expect to get back from a project when your home is sold. This year's report covers 149 U.S. metros. Not surprisingly, the nationwide cost for all projects is up at least 2 to 5 percent from last year. “At least" is important because the cost data were compiled before Hurricane Harvey, fires, and some other national disasters. The report doesn't take into account the shortages of building materials in damaged areas, which sent prices soaring. Meanwhile, the value real estate pros gave went up for only about two-thirds of the projects studied. 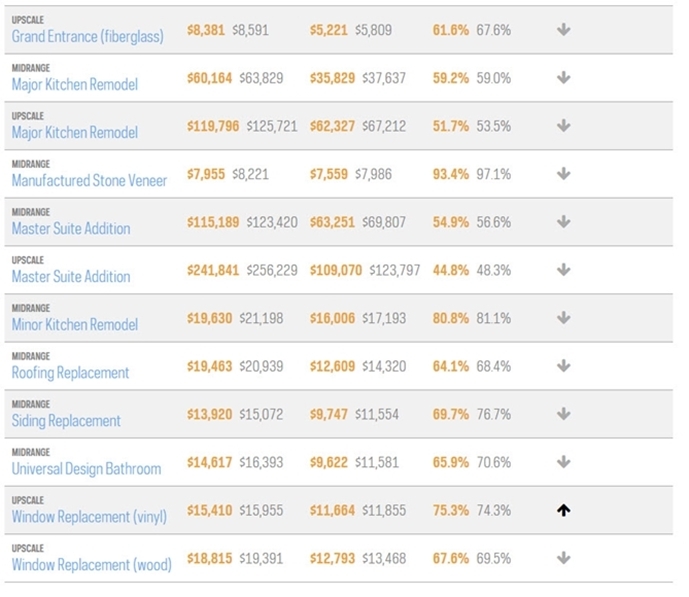 ​Texas remodeling numbers are reported in the West South Central Region of the report. Metro-specific data is included for Austin, Beaumont, Corpus Christi, Dallas, El Paso, Houston, McAllen, San Antonio, and Temple. In the table, yellow numbers include Texas. U.S. numbers are gray. Some of the biggest national decreases in value were for some of the most expensive projects, such as the addition of a master suite or a major kitchen remodel. That's a turnaround from 2017 when big-ticket items showed some of the biggest gains. The average cost recouped nationwide for the 20 projects was 57 percent, about 1 percent lower than for the same projects last year. In 62 of 100 U.S. markets, at least one project returned more than 100 percent of the cost. Five of the top six projects with the biggest bang for the buck were for work done on the outside of the house. 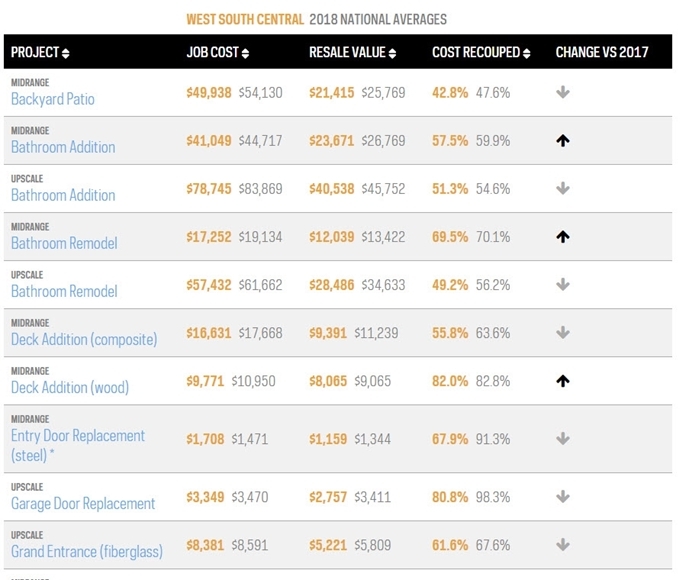 Garage door replacement led all projects nationally with 98.3 percent cost recouped. In the Texas region, manufactured stone veneer was tops with 93.4 percent. In the Texas region, only four projects recouped more this year than last: bathroom addition, bathroom remodel, deck addition (wood), and window replacement (vinyl). The report notes a big difference between replacement and remodeling jobs. “If you have to choose between them, pick the replacement work," said Webb. “It's always had a bigger payback than remodeling, and that's even more the case this year. Replacement jobs had a payback of 76 percent. That's 20 percent more than the cost recouped for remodeling. 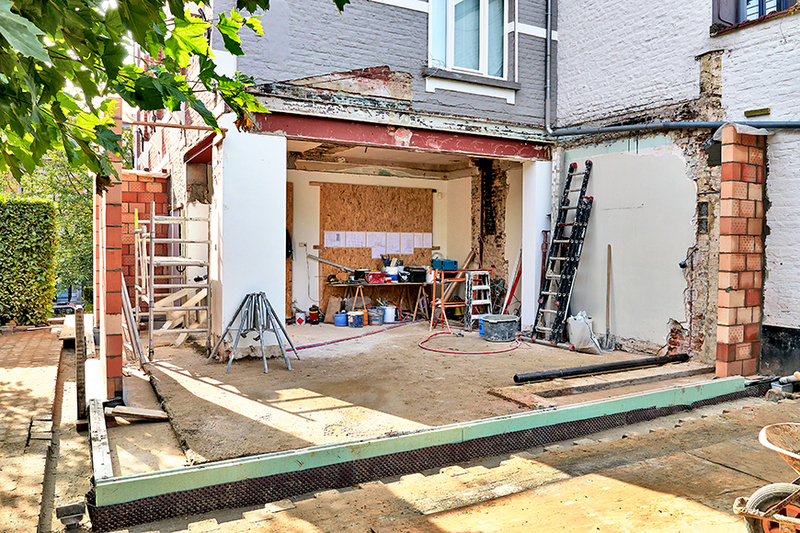 “Of course, many remodeling projects aren't done solely to boost the home's value, and if you're not planning to move, knowing the current cost-value ratio won't do you much good. Instead, just focus on the cost side of the cost-value report." Remember, local costs vary. Seek the advice of reputable remodelers and real estate professionals.